Many traditional home theaters were purpose-built or remodeled rooms, with outside light blocked out by heavy window treatments. Some even had no windows at all. 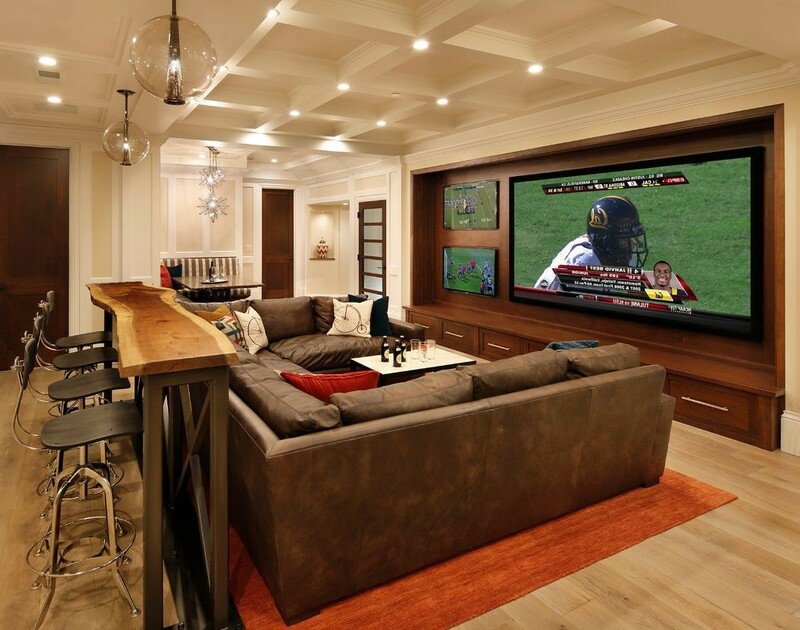 Today, families often like a media room that can also host games or other entertainment. The game room concept is a popular one all over Texas. Less-restrictive media room layouts open up possibilities for combining other activities with our media. Instead of a movie, watching sports, live music events, major news coverage, or the Oscars might be on tap for an evening. With a multipurpose media space, your family and guests can enjoy multiple media sources in conjunction with food, drinks, games, and conversation. And If you have the room, why not add a dance floor to take advantage of the sound system? A typical home theater setup used to call for a projector and screen to get the desired cinematic effect. While today’s projectors are better than ever – and increasingly cost-effective – by no means is that the only choice. The newest flat-panel technologies – OLED at the high end and zone-dimming LED panels at a variety of price points – zoom up to over 80 in size, making an excellent option for smaller rooms. HDR (high dynamic range) capability is the latest technology which makes the picture really “pop” with higher contrast and more vibrant colors, offering a big-screen experience that works for dark room movie-watching and daytime viewing alike. Ultra-short-throw projectors – those that project a wide screen from a very short distance from the wall – are also now becoming available at price points to fit many budgets and spaces. They are easier to set up than traditional projectors and can project screens up to 120 inches onto regular walls or wall-mounted screens. The latest trend in media and theater rooms is a combination of screens. This type of room might have one or more flat panels for casual viewing – like watching multiple football games - and a drop-down screen paired with a projector for movies and events. It’s a great setup for hybrid rooms. With the right home automation system, homeowners can have their own version of a sports bar or movie theater with a few taps on a tablet or remote – or even a voice command. 4K TVs and projectors are now mainstream, and streaming devices like Roku and Apple TV are capable of the high resolution along with HDR capability. Ultra HD Blu-ray is currently the best quality format for movies, but streaming services from Apple, Amazon, Netflix, Google, Vudu, and others are rapidly ramping up their libraries of movies and shows available in 4K resolution. Introduced in 2015, Dolby Atmos is a surround sound format that adds increased height and breadth to movie sound. Most new home theater receivers and processors support the format, and any future-proof media or theater room would be wise to include it. If you are designing a new space or remodeling, pay attention to ceiling height, it matters for the best Dolby Atmos experience. Also, Look for DTS:X (a Dolby Atmos competitor) compatibility in new equipment for those that want to watch 4K Blu-ray movies, as that sound format is increasingly popular on new Blu-ray releases. Soundbars initially became popular as a way to obtain a better sound experience with flat screen TVs, whose speakers generally have poor audio quality. They also offer simplified setup and superior surround sound performance in the right rooms. Soundbars have now evolved to the point where the highest end models can rival systems with separate speakers. Most soundbars come with wireless subwoofers, and some are available with rear surround speakers, all of which makes for simplified setup for some spaces. For certain multipurpose media rooms, a soundbar may be the right fit to combine powerful audio, minimalist design, and simplicity of operation. Voice control is currently all the rage for a variety of applications and particularly home control. Whether it’s Amazon’s Alexa, Google Assistant or Apple’s Siri, voice control has arrived, and new ways that you can use voice commands appear every week. The latest streaming devices from Apple, Google, Amazon, and Roku – as well as smart TVs from major manufacturers like Samsung and Sony – have varying degrees of voice capability for content search and control functions. Home automation systems extend voice control over a variety of other functions like lights, motorized shades, and thermostats while also working well with the popular voice assistants from Amazon and Google. Are you ready to upgrade or build a new media room? Let us show you the latest options. Just click below to get connected with one of our experts!